The past couple of days have been gray and cool. No wind and not much rain to speak although it is misty from time to time. I went out to paint this afternoon right before the high tide. It wasn't a very impressive high tide, just 6.8 ft or so and the waves were teeny. They almost look like summer waves. I considered, for a brief moment, just heading back to the studio to work but then remembered that there is still a lot I need to study. 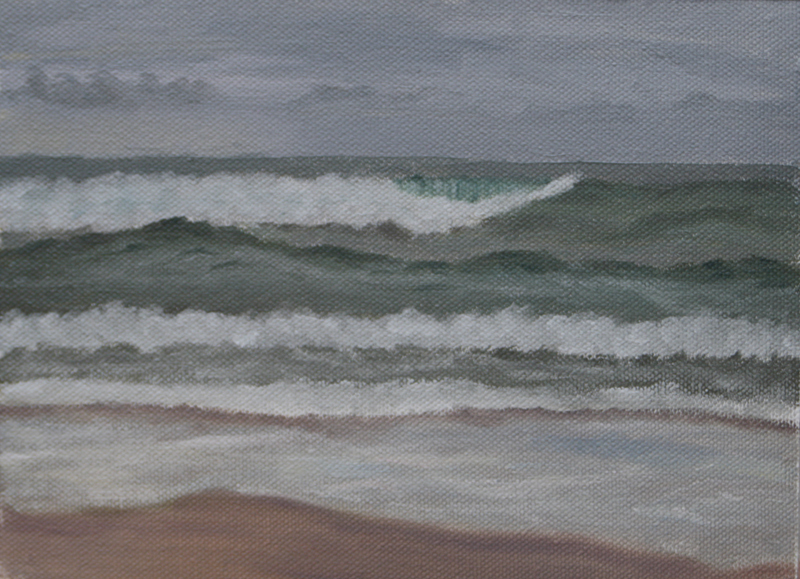 I set out to paint this study with the intent of getting the color of the sky and waves as close to what I see as possible. Breaker waves under these lighting conditions of misty gray skies with a lot of diffused light have very soft warm gray shadows. Artist Don Demers calls this light benign light and I rather like that term as it seems very descriptive. This area also has a bit of surprising color in the green-gray waves on a day like today. The green in the turn of the wave takes on a bright, clear, green hue. It seems to jump out at you when you start to pay attention. Days like today make one appreciate the subtle beauty of the colors, which are actually quite breathtaking. I kept the composition simple, which is a good thing to do in general but I wanted to concentrate on color and value. I came pretty close but not there yet. I need to tone down the white I use in the swells and the foam. There is actually a lot more value shifts than one realizes at first. I am beginning to see them, portraying them will take a bit more time. I put it the wet and less wet sand areas at the very end of the painting session so not a whole lot of time went into those areas as I wanted to concentrate on sea and sky. Small short studies such as these (3 hours or less) don't really allow time for the refinement and details that really make the painting look realistic. For now, that is OK as I have a lot to learn but as I get this down to my satisfaction, I do want to get some of the detail in too. I am finding that my memory for the sea is improving the more I study. A final note, I am working on getting some of the seascapes I have painted rephotographed so that I can offer high quality prints through Imagekind for those who would like to purchase them. I will have a nice link up when that is ready. We have nice weather heading our way. Good time to take those pictures and get some sunny seascapes painted.